If growth, or even accelerating your growth rate, is important, you must be clear where you believe intent emerges so that you can allocate your resources in the right place and ensure you’re measuring and tracking the right things to optimize and maximize the impact of your activities. If engagement comes before intent, you're creating demand. 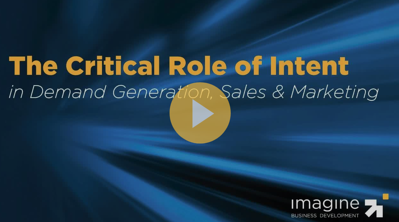 You’ve got the opportunity to have greater influence on how intent emerges, and how your prospect defines their need. If you're creating engagement after intent, then you're fulfilling demand. 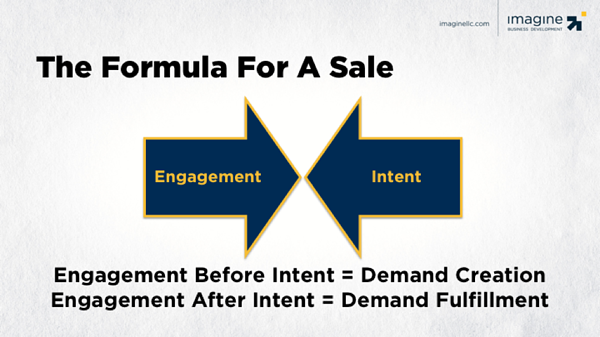 One of the reasons that we see buyers going deeper and deeper into their buying journey before they're open to talking to salespeople is because so many sellers (and marketers) focus their strategies on post-intent scenarios. Believe it or not, there’s a great benefit to bad lead generation. If your company is not good at it, the bulk of the leads you deal with are likely to be high-intent leads. If you're not really getting the conversation started or you're not good at getting people into the funnel, the prospect has to do the work to get things started with you. When a business is small or just starting out, your sales efforts naturally impact high-intent targets first. The problem is that intent is structural, meaning that in any given market at any given time there’s a set percentage of companies (or people) that have crossed the intent threshold. In most (good) markets that number is typically 3-10%. There’s not much you can do to influence intent levels directly, and the influence you have takes time to manifest itself. You can educate, challenge, and provoke, but those actions require someone to already be paying attention to you, viewing your content/viewpoint as trustworthy and relevant. So, they start generating leads, and boy, have inbound marketing and demand generation generated leads. Thousands (even hundreds of thousands) of leads have been generated. Databases are overflowing with names. The top of the funnel is bulging with leads. Salespeople are hired to “support the demand.” Yet, despite increased headcounts and higher expenses, high-velocity revenue growth is as mysterious as it was before we launched our first lead generation campaign. Sure, sales are increasing (incrementally) but costs are accelerating much faster than top-line revenue, and everyone is working harder than ever before to keep up with everything. What happened? Where did we go wrong? Is the promise of inbound marketing and demand generation just a lie told to us by evil tech companies, consultants and marketing agencies? Well, yeah, it kind of is a lie. The problem is that in all of the systems, strategies and tactics that were decided to achieve “vertical growth,” no one stopped to consider the role of intent and what that means in your market. As the lead and opportunity populations increase, “high-intent density” decreases. 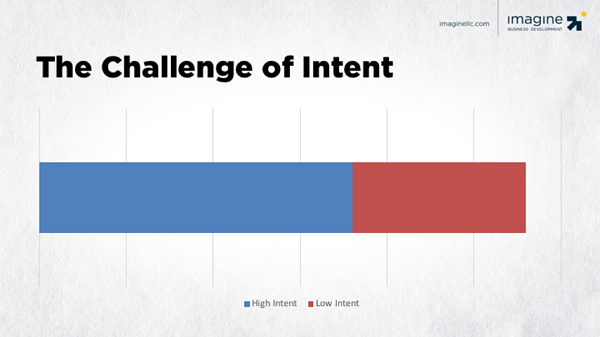 This decrease in high-intent yield is not caused by a problem with your strategy or execution. It’s just a fact. It’s a dynamic of markets. 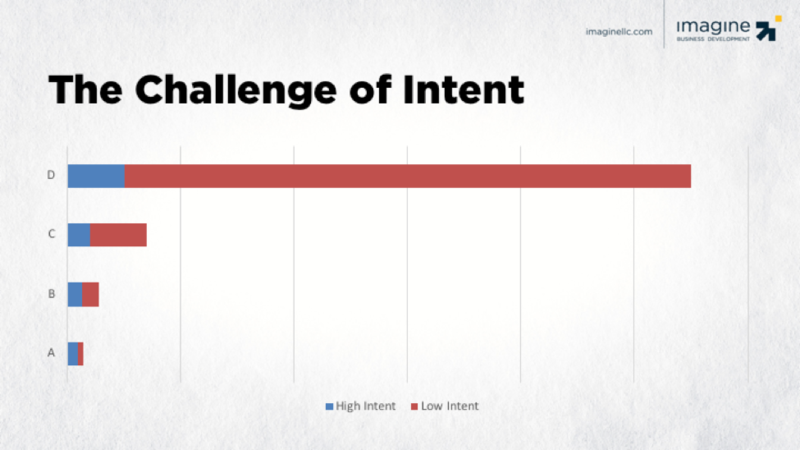 The more leads you generate the higher percentage of low-intent leads you’ll have. Another point (and it’s a REALLY important point) is that low-intent leads are extraordinarily valuable if you manage them correctly. But, unless the system has been built to address the issue of intent, it is highly likely that all leads are treated the same. Demand generation and sales teams are overwhelmed with a low-intent lead population. Sure, lip service may be paid to the buyers journey, MQLs, SQLs, etc., but fundamentally, all leads are treated the same. Here's where it gets funny. Companies think they’re doing the right thing. Their cost per lead decreases. They think they’re becoming more efficient, but in reality, they’re clogging their systems. (Just ask someone who headed manufacturing in the early 1980s about this phenomenon.) 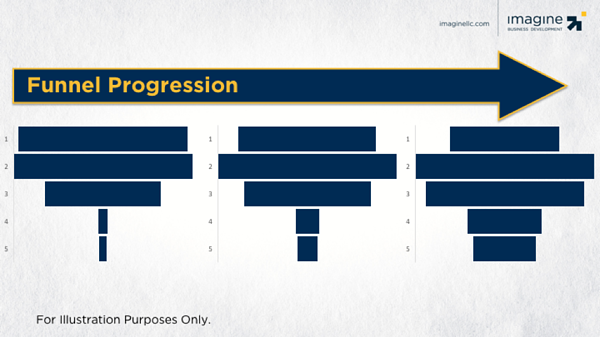 Funnels are bulging (creating what we call Bulging Funnel Disorder), and while leads are being generated at record volume, only a small percentage are being activated, creating what we call Lead Activation Syndrome. This creates a negative momentum cycle. As the system gets clogged, organizations are forced to put more into the system (leads, headcount, campaigns, etc.) so that enough comes out to meet short-term numbers, which clogs the system more and forces them to put even more in--and the vicious cycle accelerates. I love it when I work with a manufacturer. When I get a plant tour, I am absolutely blown away by how they do what they do. Seeing a complex manufacturing system in action is a wonder of the world. You see, making a sale is a far simpler (not necessarily easier) process. A manufacturer would never consider making something without the right amount of raw materials. With the right manufacturing process, production is a predictable equation. The right raw material in the right place at the right time, and voila, a finished product. Sales organizations shouldn’t behave any differently. If you want to increase the velocity of your efforts, you must focus on getting the right raw materials. If you try to produce your product (a sale) without the right raw materials, you’ll destroy your production capabilities (see scenario above). What are the right raw materials? Demand generation done properly creates greater capacity to produce throughput (customer/revenue acquisition) at higher velocities and lower costs. It builds momentum and creates a flywheel effect. Intent and engagement cause sales. Lead generation is all about generating awareness and attention. Lead management needs to be focused on generating engagement and influencing intent. When that happens, sales becomes a high-velocity, highly predictable revenue manufacturing cycle.